Tweet Share In Protections for Electronic Communications: the Stored Communications Act and the Fourth Amendment, Alexander Scolnik wrote: As technology evolves, giving individuals new forms of communicating and government agents increasingly sophisticated tools for surveillance, courts have had to continually interpret the Fourth Amendment and define the extent of its reach in light of these new advances. As technology evolves, giving individuals new forms of communicating and government agents increasingly sophisticated tools for surveillance, courts have had to continually interpret the Fourth Amendment and define the extent of its reach in light of these new advances. He also noted that even Justice Antonin Scalia, who tends to like strict originalist interpretations, has suggested that the Fourth Amendment requires flexible interpretation. There have been several extensions of the Fourth Amendment to deal with new technologies, but Constitutional protections have not come quickly. First, the postal service: Established by Benjamin Franklin in 1775, official postal mail did not receive Fourth Amendment protection until ex parte Jackson in 1878, more than a hundred years later. Second, the telegraph: In 1844, Samuel Morse transmitted the America’s first telegram (“What hath God wrought”), but despite arguments that telegrams deserved protection (see, for example, Thomas M. Cooley’s 1879 Inviolability of Telegraphic Correspondence ) the courts have never explicitly granted such protection to telegrams. In essence, technology (in the form of the telephone) made the legal issue moot. 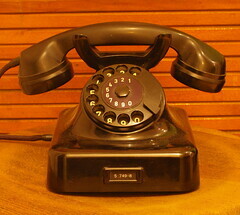 Third, the telephone: Alexander Graham Bell obtained a patent in 1876 on “an apparatus for transmitting vocal or other sounds telegraphically.” In Olmstead (1928), the Court refused to extend Fourth Amendment protections to the telephone, then changed its mind in 1967, nearly a century after Bell’s patent. Fourth, electronic mail: SDC and MIT had an early form of email in 1965, with the “@” sign being added to ARPANET’s early system around 1969. Forty-some years later, the Sixth Circuit, in Warshak, has suggested that stored email has Fourth Amendment protections, but the Supreme Court has yet to rule. So, yes, courts have continually interpreted/extended the Fourth Amendment, but it hasn’t been quick!